Over the course of 14 homepage takeovers, Ars users were invited to interact with LG OLED color trails. Against an extra dark site, the unique features of LG OLED truly stood out as users scrolled over the page. As users scroll down the page, an LG OLED Logo slowly appears in the left and right rails, again highlighting how images pop against deep black. LG tasked the WIRED Brand Lab with delivering an ad campaign that would show off the brilliant color and deepest-black levels of an LG OLED television. Ars created a custom interactive Skyboard billboard unit with a Lights Off option. 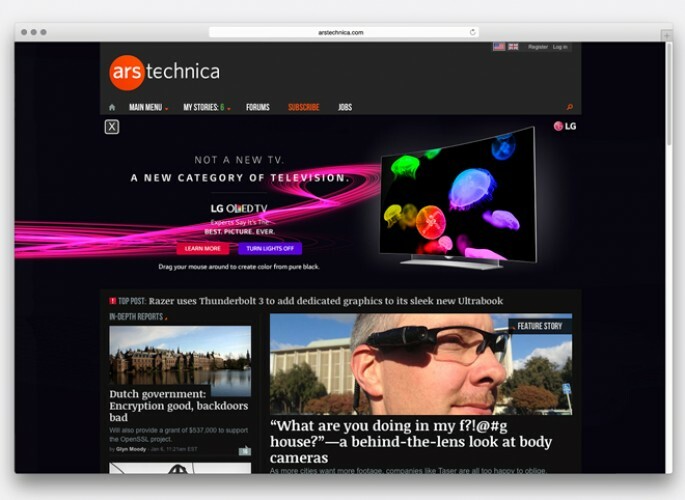 It allowed users to black out the Ars homepage and play around with LG OLED TV color trails. Against the extra-dark site, LG OLED truly popped out as users scrolled over the page. Scrolling down the page, an LG OLED logo slowly appeared in the left and right rails, again showing off how bold colors appeared against the deep black. Over the course of 14 homepage takeovers, Lights Off took the experience to the next level and allowed hyper-interested viewers an opportunity to be fully immersed in LG OLED technology without distraction. The LG OLED campaign reached consumers in an eye-catching way that was highly enticing and showcased LG OLED as the ideal display of perfect black and intense color. 14 homepage takeovers with custom wallpaper and billboard units that featured stunning LG OLED color photography and allowed users to play with LG OLED color trails.